UC Merced added a powerful new tool to the campus’s Imaging and Microscopy Facility. The newly acquired Zeiss LSM 880 is a state-of-the-art laser scanning confocal microscope that represents a huge leap forward for the university’s imaging capabilities. “Within UC Merced, this is by far the most advanced, state-of-the-art light microscope,” School of Engineering Professor Anand Subramaniam said. 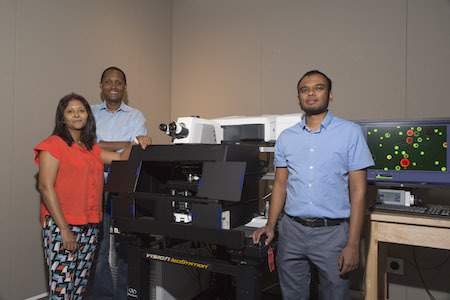 Subramaniam led the three-person team — which included School of Natural Science professors Sayantani Ghosh and Teamrat Ghezzehei — that brought the microscope to UC Merced. But getting there wasn’t easy. “The proposal written by Professor Subramaniam and his colleagues was clearly identified as the best of the group by a panel of faculty peers at the university,” Traina said. With ORED’s endorsement, Subramanian and company next had to convince the National Science Foundation that UC Merced was deserving of a Major Research Instrumentation (MRI) award. The grant was awarded last September. So how much does a top-of-the-line confocal microscope cost? A lot, it turns out. The NSF MRI grant covered $311,815, while the School of Natural Sciences, the School of Engineering and ORED covered the remaining $153,228. That’s $465,043 for one microscope. And according to Subramaniam and Ghosh, it’s worth every penny. Previously, UC Merced researchers seeking access to comparable equipment had to travel to microscopy facilities housed at Stanford or UC Berkeley. More than just inconvenient, in some cases it was impossible. Some samples are too sensitive to travel; others might survive the journey only to yield data unfit for publication. Bringing the Zeiss LSM 880 to UC Merced solved this. With the same state-of-the-art equipment on campus, researchers can pursue avenues of inquiry they might otherwise have avoided. But what makes the microscope such a valuable research tool? The team points to its versatility, power and speed. The confocal has six lasers, allowing for multicolor imaging. It also has the latest Airyscan technology, a feature that minimizes signal loss and brings resolution down to 110 nanometers (for perspective, a human hair is about 100,000 nanometers thick), allowing the microscope to discern details other confocals cannot. The microscope is also fast. Scientists use confocals because they can capture still images in very quick succession, essentially producing a movie of microscopic processes in action. Typically, there’s a trade-off between speed and resolution. The more seamless the movie, the blurrier the image. This microscope mitigates that problem, providing high-speed, high-resolution dynamic imaging. For Subramaniam, this feature is key. His lab develops engineering approaches for synthesizing artificial cells. Understanding the dynamic processes involved in the earliest stages of self-assembly of molecules is crucial. How do a bunch of lipids, essentially individual fat molecules, come together to form structures that resemble hollow cells? This microscope will help him and his students figure it out. For Ghosh, whose lab is developing high-efficiency photovoltaic devices, she and her students need to know how a device’s microstructure affects its performance. To do this, Ghosh needs two kinds of microscopes. They already had one. Now they have the other. This microscope will do just that. At least 20 faculty, along with their graduate students and research staff members, are expected to regularly use the instrument. Moreover, this microscope makes UC Merced a magnet for top-tier graduate students, postdocs and faculty. It brings the campus’s imaging facilities on par with long-established research institutes and demonstrates that the university is capable of distinguishing itself when pitted against other Ph.D.-granting institutions competing for the same prestigious grants. “It was clear to all of us that acquisition of this instrument would greatly enhance the research and education environment at UC Merced,” Traina said.